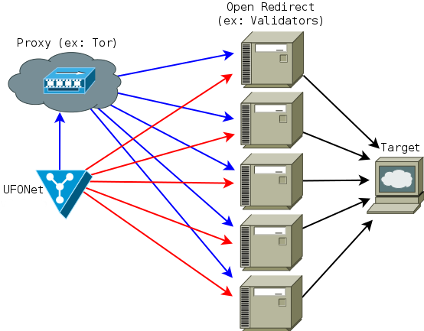 It is a toolkit designed to launch DDoS and DoS attacks. unavailable by overwhelming it (for example, with traffic...) from multiple sources. unavailable by overwhelming it (for example, with traffic...) from a single source. to control them. It is commonly used to make DDoS attacks. What is the philosophy behind UFONet? not who builds it and when..."
Why can UFONet be more special, than for example, other botnets previously built? How does UFONet work technically? the TCP/SYN flood attack, which is perform on Layer 3 (Network). 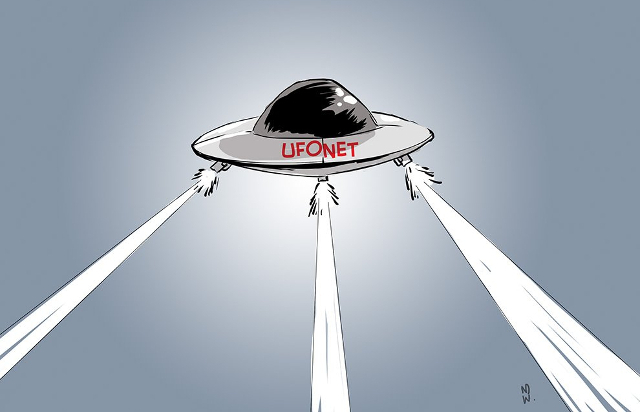 Is UFONet a "strong" botnet? and wait until traffic (noise) reaches the maximum limit that closes the service. What's the difference between: 'zombies', 'aliens', 'droids', 'ucavs'...? Is it possible to stress target's database using UFONet? on a target's search input form. This floods database with queries. Is there a LOIC connected to UFONet? Yes, hehe... It has implemented an advanced version of that software that supports proxies. How should a powerful attack that combines all the techniques (DDoS+DoS)? How can I start with UFONet; for example using GNU/Linux (ex: Kali)? Which libs should I install? How can I start a Graphical User Interface (GUI)? It is an IRC gateway to Freenode where UFONet 'masters' can meet. Is it possible to update the tool automatically? Yes. But only if you have cloned UFONet from a Git repository. It is a P2P daemon to share 'zombies' with other UFONet 'masters'. Where can I download more 'zombies'? Can I spread 'zombies' with a web-server? How can I know if my 'zombies' are working properly? You can report errors on: Github issues. Also you can stay in touch reporting on my "mothership" (using BOARD provided by default). Can I pay you for DDoS a target? No. Actually, I am providing you one for free/gratis... hehe.